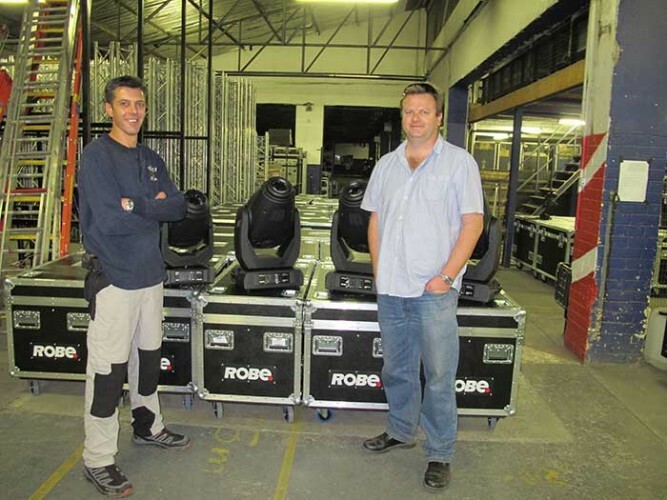 Johannesburg based Gearhouse South Africa (GHSA) has invested in 150 of Robe’s latest moving lights including 54 Pointes, 36 LEDWash 600s, 24 DLXs, 24 DLFs and 12 DLSs. The DLFs and DLXs went straight on to the current series of ‘So You Think You Can Dance’ which is being recorded at the Renaissance Centre in downtown Johannesburg and broadcast on national TV by SABC, with lighting designed by GHSA’s Robert Grobler. Since its launch in 2010, Robe’s LEDWash has become one of the most successful products in its class, and is now routinely appearing on international lighting specs as the default ‘LED wash fixture’. GHSA services many top artists who are now regularly visiting South Africa on their world tours and so it’s important to have the most popular products available to ensure that lighting designers and directors can have their rigs matched as closely as possible. Another parameter informing GHSA’s decision to go with Robe and in particular what led Andrews to choose the LED products, is his belief in the quality and advantages of well designed and engineered LED fixtures and the role that they can play in productions both now and in the future. Related to this is also the smaller size of Robe’s DL series luminaires, which means more fixtures can be practically fitted into tighter spaces or those challenged for weight loadings, and achieve better results. The DLS profile in particular was chosen for its shuttering capabilities. This is vital for shows and events adopting the popular format of wide screens upstage and presenter downstage in front of it, where it’s essential that the key lighting is neat, tidy and bright. Andrews actually thinks that it is Robe’s new multi-purpose Pointe that will become a real ‘star of the show’ – and he’s certain that they will be investing in more of these soon! Again he mentions the small size, light weight and all round adaptability – it can be used as a Spot, Beam, Wash or FX unit. Robe’s Pointe was launched at Prolight+Sound in Frankfurt in April 2013 and since that time has become the brands fastest ever selling product, with over 10,000 orders placed in the first four months of production. The bottom line for any busy rental company is always reliability and that’s also an area where Robe has always excelled. 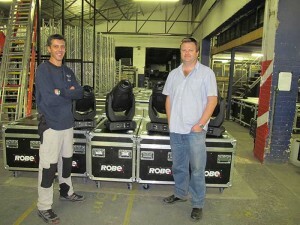 GHSA’s consignment of Robe fixtures was delivered by South African distributor DWR, a leading professional lighting sales company with an unpatrolled reputation for excellence in the country. Over time, GHSA’s commitment to Robe’s new and LED technology will preempt other cost reductions as well, including the requirement for fewer, smaller generators on events which will consume less fuel, smaller vehicles will be needed to transport the kit, smaller trusses will make rigging quicker and less complex, etc. In picture: DWR’s Duncan Riley and Gearhouse SA’s Stuart Andrews.